The first day of sales for Google's Android phone hasn't quite echoed the frenzy surrounding initial iPhone sales, but a few hardy souls across the country got up early to buy the first devices available in stores. The G1, an HTC phone offered by T-Mobile that is the first to run Google's Android operating system, went on sale on Wednesday at stores across the U.S. San Francisco residents had the very first opportunity to buy the phones in person, with one T-Mobile store there opening on Tuesday evening. In addition, many people who pre-ordered the G1 started receiving their handsets in the mail on Tuesday. On the East Coast, five people stood in line in drizzle and 40-degree temperatures to buy G1 phones at the Harvard Square T-Mobile location in Cambridge, Massachusetts. At 8 a.m. the store door opened, and they were quickly ushered inside to be served. The small crowd was nothing compared with sales of the iPhone 3G in July in nearby downtown Boston, where hundreds of customers waited in line, some of them for several days. But a T-Mobile manager said he was still pleased with the turnout, which remained fairly steady through the early morning hours. The gloomy skies and sudden colder, rainy weather might have dampered sales, several T-Mobile representatives at the store said. Jonathan Blood, national director of business development for T-Mobile, said in an interview at the store that there were 200 G1 phones on sale at the Cambridge store, which stands across the street from Harvard University and a few blocks from Massachusetts Institute of Technology. Blood said the biggest sales of the G1 apparently occurred at a downtown Boston T-Mobile-owned retail store that sold 20 in the first hour. There are 13 T-Mobile-owned stores in the Boston area, but about 50 retailers, including T-Mobile affiliate stores in the area, were carrying the phone, he said. T-Mobile shop workers in other stores were more reluctant to talk to reporters. In downtown Manhattan, an employee named Ariel, who declined to give his last name, said there was a line of people waiting outside the store when it opened at 8 a.m., but he did not say how many G1 customers were in it. He noted that people were there not only for the G1, but also "for other things," adding that sometimes there is a line outside the store before opening even on a normal business day. Ariel said there was a "steady stream" of customers coming into the store to purchase the G1, but declined to say how many the store had sold. At about 11:15 a.m., there were no customers in the store, and salespeople were lined up near the front of the store chatting with one another. T-Mobile already took a considerable amount of preorders for the G1 online, which could account for the lack of customers in the store, he said. The manager of one T-Mobile store on Canal Street, which had no customers at about 11:30 a.m., said the store sold out of G1s in two hours, but was still accepting customers who wanted to order the phone. The store manager, who declined to give his name because he said T-Mobile's corporate office had instructed employees not to speak to the press, would not say how many G1s the store had stocked. He did acknowledge the location was one of the smaller T-Mobile stores in the city. Customers who bought the G1 in the first two hours at the Cambridge location tended to be either high-end users with technical backgrounds or consumers who were familiar with the T-Mobile Sidekick, which they said was similar to the G1 because of the way that the keyboard flips out of the body of both devices. The first person in line at Cambridge to buy a G1, Jacek Ambroziak, arrived at 6:30 a.m. and said he had been eager to use an actual G1 after spending about eight months with an online G1 emulator. Ambroziak, an independent software developer from Cambridge, said he is creating three G1 applications that are not yet available to download, but should be soon. Several buyers at the Cambridge store said they were eager to see how well the initial G1 works, and many expected to encounter some bugs. "I don't know about G1's future, but Android should explode," Ambroziak said. 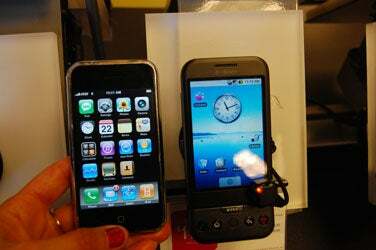 While several buyers at the Cambridge store worked at MIT or Harvard, some were purchasing the device as a gift. Roger Cummings, a Loeb fellow at Harvard originally from Minneapolis, said he would be giving the G1 to his sixth-grade son, who has been using the Sidekick and liked the idea of the G1 with its flip-out keyboard. Nimo Hashi, who described herself as a social-services worker in the Cambridge area, said she would use the G1 mainly for texting. "I bought it because it looked good," she said before rushing off to work. At the downtown San Francisco store where the G1 first went on sale Tuesday evening, there was no line before the doors opened Wednesday morning and just a handful of customers checking out the phone in the first hour of business. Scott Simons, who lives in San Francisco and works in legal support services, was considering a G1 for his son, a high-school student. Simons is particularly interested in it for Google Apps, which he said students at his son's school use for composing, sharing and turning in assignments. Simons also was hoping for a good interface for Google Calendar, which his family uses to coordinate schedules. Though he's a longtime Mac user who owns an iPhone, Simons has been dissatisfied with the iPhone's software. He complained that he can't use all the features of Google Calendar on the iPhone and that Apple's own mail application pales in comparison to Gmail. Simons thinks Android phones eventually will offer a better set of applications than does the iPhone. Simons was also pleased with the G1's keyboard, compared with the iPhone's virtual keyboard, and said the phone seemed small and durable enough for his son to carry around. However, he said he didn't know how good T-Mobile's customer service would be and still had to investigate the monthly service plans. In a neighborhood store in Seattle, Devon Jarrett-Nomides waited to clear up some issues with his bank account before getting approved to sign up for the phone. He said he was fifth in line when the store opened, with the first in line reporting that he'd been there all night. At around 8:30 a.m., with about seven customers in the store, the doors to the store remained locked for "crowd control" reasons, according to store employee Darren, who unlocked the door for people to come and go. Tom Canty was also waiting for approval for a phone he was buying for his wife. He just happened to arrive on the first day of sales. He was driving by the store on the way to work and noticed the line out front. "I said, 'Oh right, the G1,'" he said. Canty, Jarrett-Nomides and others in the store said they were interested in the G1 over Apple's iPhone because of the keyboard.